Marvel has been killing it on the big screen. After decades of laughable movie adaptations of their most-beloved comic book superheros, Marvel has turned it around in a big way. Since the turn of the century, movie studios such as Marvel, Fox and Sony have translated superheros such as Spiderman, Captain America, The X-Men and Iron Man into some of the most successful (and bankable) movie franchises. Even with all that, it wasn’t easy to find a full list of Marvel movies that have come out in the modern era of superhero films. Since Marvel sold off the rights to many of their characters when the company was struggling, many of the timelines of upcoming Marvel movies were based on the 4-6 studios that owned them and the marketing follows along those battle lines. Being a Marvel fanboy through-and-through, I wanted to put together a comprehensive timeline of all the Marvel movies since 2000 including past, present and the upcoming comic book films featuring Marvel characters. You can sort the list below by release date (default), name of the movie, or Rotten Tomatoes score (fun!) — just hover over the headings and click the arrows. You can see Rotten Tomatoes own (outdated) list here. 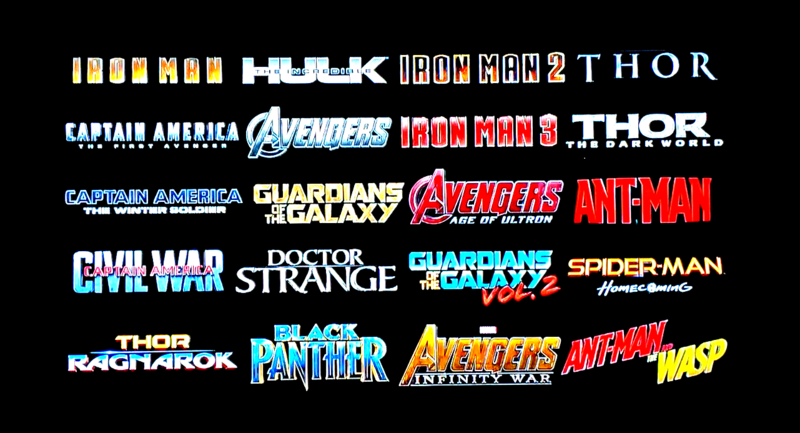 You know, I wanted to know all the Marvel movies that were coming out this year, not just the ones from Marvel Studios. I like that I have at least four Marvel movies to look forward to over the next three years. And upcoming is 2018’s nickname when it comes to movie releases. There are EIGHT, count ’em EIGHT Marvel movies coming out in 2018. Eight in eighteen! No doubt Marvel has found a formula for success (except for the Fantastic Four franchise — sheesh) with many of their heavy hitters — Thor, Iron Man, X-Men, Captain America, Spiderman, Wolverine and the Avengers — not only raking in billions of dollars but also receiving (mostly) favorable reviews from critics on Rotten Tomatoes. And they plan on bringing most of these characters together into an all-encompassing Infinity Gauntlet movie. Yes, their the vast majority of their villains clearly have character development issues and the lack of diversity with Asian characters and female leads is definitely an issue they’re (slowly) attempting to remedy. In the face of that, Marvel movies have pushed the boundaries of what we’ve come to expect from the superhero genre. The Marvel Cinematic Universe has opened the doors for quirkier characters to step up into the spotlight. Most recently the success of secondary and tertiary characters like Deadpool, Ant-Man and the Guardians of the Galaxy gives room for the studios to take bigger risks on more of the same: Who would have thought that we’d have movies for The Black Panther, Doctor Stranger, Gambit and The Inhumans 15 years ago? In 15 more years, we’ll be pining about the upcoming Neosonic Teenage Warhead film.